The top closer on the free-agent market this winter has found a new home. 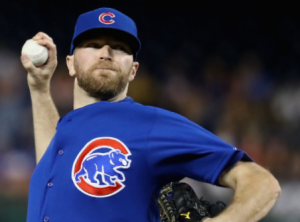 On Friday, the Colorado Rockies agreed to a deal with Wade Davis. The deal is reportedly worth $52 million over three years. There is also a vesting option for the 2021 season worth $14 million as long as Davis finishes 30 games for the Rockies in 2020. The move should complete Colorado’s work to build a strong and competitive bullpen this offseason. After becoming an invaluable part of the Kansas City Royals bullpen and helping them win the World Series in 2015, Davis was traded to the Chicago Cubs last winter. He had great success as Chicago’s closer, converting 32 of 33 save opportunities while posting a 2.30 ERA. Davis has also been an all-star in each of the past three seasons. He entered the offseason as arguably the top closer on the market and has cashed in on several impressive seasons with a lucrative contract. The fact that Davis ended up signing with the Rockies is a bit of a surprise. Colorado’s closer last season was Greg Holland, who teamed up with Davis in Kansas City’s bullpen from 2013 to 2015. Despite a rough patch in August, Holland excelled as Colorado’s closer, converting 41 of 45 save opportunities and posting a 3.61 ERA while pitching in a hitter-friendly environment. Most believed the Rockies would make a concerted effort to re-sign Holland this winter. Instead, they’ve ended up with Davis as the back of their bullpen. Davis didn’t earn quite as much on the open market as closers like Aroldis Chapman and Kenley Jansen did last year. But his signing does continue a trend of teams paying big bucks for elite relief pitchers. With a deal that’s essentially four years and $66 million, Davis sets up other relievers for a big payday. Holland is now the top relief pitcher available and should ultimately garner a contract worth almost as much as the one Davis got. Several second-tier relievers should also be in line for multi-year deals worth a substantial amount of money. For the Rockies, the addition of Davis should put the finishing touches on the team’s bullpen. Earlier this winter, the Rockies re-signed Jake McGee and added longtime Indians reliever Bryan Shaw to help fortify their bullpen. McGee and Shaw will now team up with pitchers like Chris Rusin and Mike Dunn to give the Rockies a formidable group of setup men pitching in front of Davis. After the Rockies reached the wild-card game in 2017, expectations will be high heading into 2018. The team already has a potent lineup and an impressive contingent of young starting pitchers. Building a strong bullpen would appear to be the final piece of the puzzle for Colorado. The fact that the Rockies were willing to commit so much money to Davis shows they’re serious about being competitive. Obviously, there’s a big gap in the NL West between the Dodgers and everyone else. But with Davis in place as closer, the Rockies may have the kind of bullpen they need to challenge the Dodgers and return to the playoffs in 2018.